Are you tired of your Air Conditioner's copper piping being vulnerable to thieves or stolen? 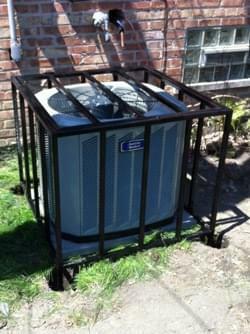 Windy City Mechanical, Inc. offers a solution to the theft of the copper for the air conditioner. A hand fabricated and painted A/C cage. 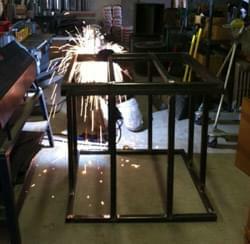 Our cages are individualized specifically to fit the needs of our customers and their homes. Whether it needs to be bolted to the concrete or if a hole needs to be dug to mount the cage, with a concrete footing. We will work with any circumstance. Not only do the cages prevent theft but also leave YOU "the customer" with a peace of mind. These cages can save you money on future repairs or possibly even replacements. Our cages can be financed.